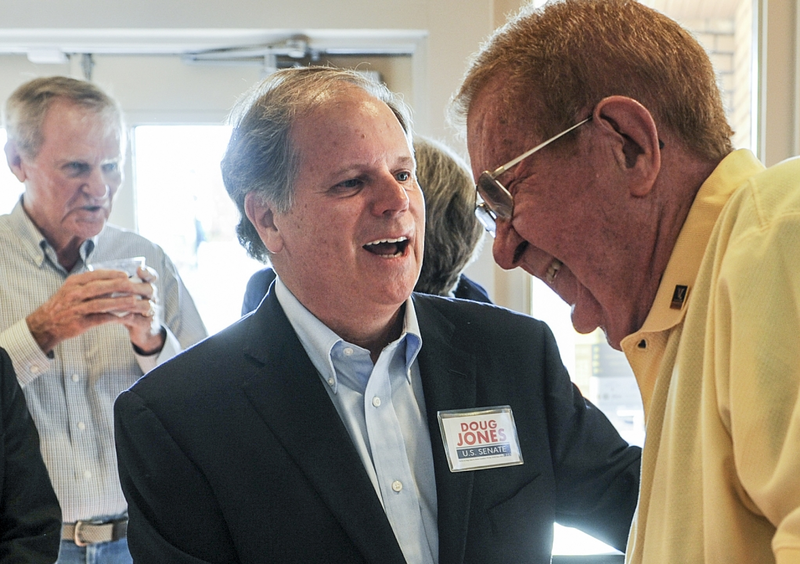 A new JMC Analytics poll in Alabama finds Doug Jones (D) now leading Roy Moore (R) in the U.S. Senate special election run off, 46% to 42%, with 9% undecided. A former colleague of GOP Senate candidate Roy Moore said that it was “common knowledge” that the Alabama Republican dated high school girls when he worked in the Etowah County District Attorney’s Office in the 1980s, The Hill reports. Former CIA director John Brennan spoke on CNN’s State of the Union alongside Clapper and said Trump is demonstrating to world leaders that he can be “played” with a little ego stroking. “By not confronting the issue directly and not acknowledging to Putin that we know you’re responsible for this, I think he’s giving Putin a pass,” Brennan said. “I think it demonstrates to Mr. Putin that Donald Trump can be played by foreign leaders who are going to appeal to his ego and try to play upon his insecurities, which is very, very worrisome from a national security standpoint.” Clapper agreed that Trump “seems very susceptible to rolling out the red carpet and honor guards and all the trappings and pomp and circumstance that come with the office, and I think that appeals to him, and I think it plays to his insecurities.” As a result of this dynamic, “both the Chinese and Russians think they can play him,” he added. On the one hand, he is of the mind that if he admits it, his win is illegitimate. He is correct on that. On the other hand, he can’t admit it because that would be like admitting he is complicit. And he is right on that too. Because he was. Today 60,000 neo-fascists marched openly in Poland under a slogan taken from a Donald Trump speech. Read. This is a good news story. Frank Bruni on Republicans driving off the sexual assault cliff. “When Zeigler was asked by The Washington Examiner about an allegation that the Senate candidate Roy Moore initiated sexual contact with a 14-year-old girl when he was 32, Zeigler cited the biblical couple to say, essentially: No biggie! This is as old as Christianity. Jennifer Rubin says the GOP cannot be rebranded. It must be junked. “How could one “rebrand” this, or trust these people again? I find it hard to imagine how. So the future of the GOP? It’s either a nationalist front party or a battleground mostly between Trumpists and strident ultra-right-wingers whose platform (repeal Obamacare; corporate tax cuts; reckless foreign policy that imagines war with Iran and/or North Korea are viable options) is unacceptable to the vast majority of the country. It’s not a civil war in which I’d have a favorite side. Looks like one more Roy Moore accuser is to announce today. New accuser says she was 15 at the time and describes a detailed sexual assault. And there it is. Looks like Allred wants a Senate hearing in two weeks — Mrs. Nelson not taking any questions until that hearing. Sounds like if there is no hearing, all bets are off. Emerson College poll has Moore up by 10.
i may be misreading all of that, but it says Moore is up by 10. jones has gone UP 10 points since the last poll, but Alabamans still clearly prefer a pedo to a Dem. No, it has Moore up by 10. I’d throw ’em all out, because they’re based on likely-voter models that might not hold true in a special. The Polls had Clinton winning in a walk over Trump. Clinton won by 2% over Trump. That’s well within the margin of error of the wide majority of polling organizations. As predicted another accuser has come forth, and where there’s one there’s likely two or three more. As noted it matters little to the Evangelicals and your standard issue Trump voter. Also noted don’t trust the polls, I never do and rarely am I disappointed. This will go down to the wire, an accomplishment unto itself in that blighted state of ignorance. But look at the big picture, if Moore does go to the senate he will be the bane of McConnell and a lightning rod for public disgust when he goes off about “god’s law” contravening federal law. Regardless his baggage train will stretch all the way back to Alabama and the ever growing list of accusers, who I suspect are just getting started. Roy Moore was banned from the local mall because he was pursuing teenage girls. Getting banned from a mall is not easy. That’s a high level of creepy.